I love those few days of the year when my skin takes on a life of its own. It is clear, blemish- and wrinkle-free, and has a glow from within. 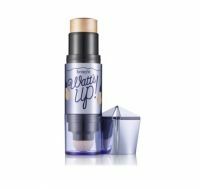 Benefit goes a long way in mimicking this radiance with their genius soft highlighter, "Watt's Up." I initially received it as a birthday gift from Sephora and went on to purchase the full size. Products which add radiance can be tricky for those with v...read moreery fair skin, but the champagne hue is ultimately becoming (evidently it works for those with darker tones as well). It smooths on effortlessly, and so you control the amount of coverage you want (I don't like the sponge tip on the full-size product; it removes more of the highlighter than it applies). I use my finger or another brush to highlight cheekbones, browbones, whatever--it depends on whether it is day or night. The color is so sheer, so wearable and flattering that it is almost imperceptible. People don't notice that you are sporting a highlighter--they simply notice a new "glow" about you (which is the entire purpose of wearing makeup in the first place, isn't it?). If you do choose to use the sponge end, please clean it regularly so that you do not contaminate the product. I'm not OCD, just very aware of how easily we spread germs. I received this as swag at ULTA. The rep gave her talk, and it sounded like an exciting product. She chose me to be the guinea pig, and I was really impressed when she started applying it to my face. . This highlighter actually shows up with just a little swipe of the top of the container. It is a cream stick in a bottle that looks like a light bulb. Cute. Especially with the name. I love h...read moreow it goes on smoothly and blends really well. In a pinch I had to use it as an under eye concealer, and it looked great! So, it's also multi-tasking. Just be sure to not apply too much because a little goes a long way. One of the better highlighters i have used. I received this as a free birthday gift from Sephora and I love it! I love it even without the little blending sponge that the full size comes with! The formula is smooth and creamy and applies in a nice silky swipe that is easily blended and doesn't stand out with too much shimmer like a lot of other highlighters. There's no obnoxious fragrance and isn't so heavy that you can tell you're weari...read moreng it, it's not noticeable it just creates a nice look no matter how much or how little you apply. I use mine just beneath my brows, my cupid's bow, my cheek bones, the bridge of my nose and sometimes around my eyes when I don't have giant bags beneath them! I normally avoid using a highlighter because I find myself stuck with ones that are too pink, have too much shimmer, sparkles(UGH), or ones that look like I have frosting all only my face (I won't name brands but you know who you are!!). I will be buying the full size product! Also I haven't tried it with the applicator but I don't really think one is necessary, this blends so easily with just finger tips there really isn't a point of the extra step.